Thanks to Susan Plawsky for representing Circadian Rhythm Sleep Disorders at today's (Dec 11) meeting of the NIH Sleep Disorders Research Advisory Board (SDRAB). Susan was formerly on the Board of Directors of the Circadian Sleep Disorders Network. The SDRAB will be revising the NIH Sleep Disorders Research Plan. Susan volunteered to be on the working group on Sleep and Circadian Disorders, focusing on treatment. We've created a new calculator, that predicts both wake times and sleep times into the future, for people with non-24 with a consistent delay. It's at www.circadiansleepdisorders.org/info/N24calc.php. Elections for the Board of Directors of Circadian Sleep Disorders Network have concluded. The board welcomes newly elected board member Lily Style. Re-elected were Asli Kumcu, Beth Macdonald, and Peter Mansbach. Thanks to all who ran and all who voted. Valerie S Johnson has resigned as secretary of CSD-N. Elections for the Board of Directors of Circadian Sleep Disorders Network will be held from Dec 1 through Dec 15. CSD-N members in good standing (i.e. who have paid their dues for CY 2015 or 2016) should receive ballots around Dec 1. Board members serve two-year terms, which are staggered, so half the board is elected every year. There are four slots to be filled. Three incumbent board members are running again: Peter Mansbach, the current president; Asli Kumcu, and Beth Macdonald. Two new volunteers have been nominated: Eric Oyen and Lily Style. Write-ups submitted by the candidates will be published in the upcoming newsletter, and will also appear on the ballots. 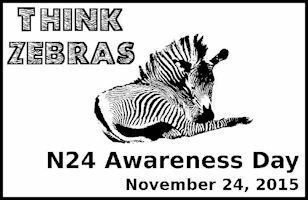 This year's theme is Think Zebras. This comes from a saying that doctors are taught: "If you hear hoof beats think horses, not zebras." When faced with symptoms, try to think of the more common causes first and not the rare ones. The patient with cough, fever and lassitude is more likely have the flu than, say, Q fever. While that's a reasonable rule, if followed too rigidly it leaves people with rare disorders misdiagnosed or undiagnosed. This is often the case with N24. People presenting with the symptoms of N24 are often diagnosed with more common conditions such as insomnia or depression and treated accordingly, usually with bad results. Or, in many cases, their symptoms are not believed or left as a mystery. 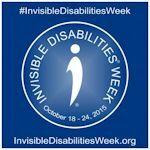 Oct 18 - 24, 2015, is Invisible Disabilities Week, sponsored by the Invisible Disabilities Association. Details available on their website, www.invisibledisabilities.org/, Facebook, or Twitter (#InvisibleDisabilitiesWeek). Thanks to Susan Plawsky for representing Circadian Rhythm Sleep Disorders at the Oct 9 meeting of the NIH Sleep Disorders Research Advisory Board (SDRAB). Susan was formerly on the Board of Directors of the Circadian Sleep Disorders Network. She participated in the SDRAB meeting as an "ad hoc" member of the SDRAB. The process for selecting an official circadian member of the SDRAB is ongoing, but in the meantime we have a representative of the circadian disorders community participating on the board. The SDRAB will be revising the NIH Sleep Disorders Research Plan. Scientific American Mind has an excellent article, Out of Sync, in its Sept/Oct 2015 issue. It covers DSPD and Non-24, although much of the article is about Sparrow Rose Jones and her struggle with Non-24. Circadian Sleep Disorders Network was contacted for information and references that provided background for this article. "Honestly, if you ask me, I would prefer to have heart failure than a non-24-hour sleep-wake-cycle disorder," says Robert J. Thomas, a sleep medicine doctor at Beth Israel Deaconess Medical Center in Boston who specializes in circadian disorders. "That's how badly these patients suffer." Dr Thomas is on the Medical Advisory Board of Circadian Sleep Disorders Network. Vanda Pharmaceuticals Inc. announced (July 7) that the European Commission approved HETLIOZ® (tasimelteon) for the treatment of Non-24-Hour Sleep-Wake Disorder in totally blind adults in the European Union (EU). Note: Circadian Sleep Disorders Network is not in any way affiliated with Vanda Pharmaceuticals Inc.
Hetlioz Approval for Sighted Non-24 Challenged in U.S.
Now (June 2015) Public Citizen has filed a petition with the FDA requesting that the approval and prescribing information be limited to blind patients without light perception, since it was never tested on sighted people. They also request additional safety information. Note: Circadian Sleep Disorders Network is not in any way affiliated with Vanda Pharmaceuticals Inc. or Public Citizen. Our Non-24 Question and Answer document is now available in Spanish, too. Thanks to member Maggie G for doing the translation, and Lo Bellver, a native Spanish speaker, for reviewing it! A Spanish translation of the DSPS Q&A was posted recently as well. NIH has asked stakeholders to participate in their Strategic Visioning Survey, to gather ideas for areas requiring (and ripe for) future research and to determine the level of interest. The Sleep Research Society (SRS) contributed a number of entries for sleep research, and CSD-N members added two more. Preliminary voting ended May 15, 2015. These entries are being reviewed, revised, and consolidated by NIH and its advisory boards. Public comments and votes will again be solicited, on the revised entries, from July 1 - Aug 15. Elucidate the different causes of circadian disorders, and tailor the treatment to the cause. CSD-N alerted its current and recent members of the opportunity to vote. The journal Sleep Review has just published an article on Non-24 by our vice president, James Fadden. The web version is up now. A print edition and a digital edition (pdf) are expected soon. Thanks, James, for putting in the work on this, obviously a significant effort. Circadian Sleep Disorders Network has submitted its comments to AASM on their draft Clinical Practice Guideline for the Treatment of Intrinsic Circadian Rhythm Sleep-Wake Disorders. A number of our Board members contributed to these comments. We would have preferred more time for discussion, but we wanted to submit what we had by the May 12 deadline, in order to raise some of our concerns and be part of the discussion. Circadian Sleep Disorders Network (CSD-N) has asked for people to represent the circadian community on the NIH Sleep Disorders Research Advisory Board (SDRAB). Several people have applied. The CSD-N Board has submitted a supporting letter. NIH is reviewing the applications, but has advised us that it can take six months or more before a decision is made. Peter Mansbach (CSD-N president) attended the afternoon portion of the NIH (U.S. National Institutes of Health) SDRAB (Sleep Disorders Research Advisory Board) meeting on Apr 29. The public had a chance to speak, and he took that opportunity to point out rather strongly that we had been urging NIH to add Circadian Rhythm Sleep Disorders information to its website for the past three years, but it still hasn't happened. Dr Phyllis Zee, who is on our CSD-N Medical Advisory Board, supported him and offered to write the articles. Several other members of the SDRAB also voiced support. He also said that the circadian rhythm community should get a seat on the board. The number of seats is established by Congress, so they cannot add a new one. But it was suggested that they rotate among the sleep communities instead of always being sleep apnea, restless legs, narcolepsy, and insomnia as in the past. He also took the opportunity (in response to Monday and Tuesday's workshop on sleep biomarkers) to underscore the importance of circadian rhythm biomarkers to our circadian-disordered community. A simpler test to determine our internal phase (what time of day our body thinks it is) would simplify diagnosis, and would help the doctor in determining what time of day to start treatments such as light and melatonin. It would also help with primary care doctors who are not familiar with - or do not believe in - circadian disorders, since such a test would alert them immediately to the need for a sleep specialist rather than just a sleeping pill. Four of our board members recently completed an online Coursera course, Circadian Clocks: How Rhythms Structure Life. The six lectures were delivered by Dr Till Roenneberg and Dr Martha Merrow, and covered circadian rhythms in animals as well as humans, and the molecular processes in the basic cellular clock. Board members completing the course are James Fadden, Beth Macdonald, Peter Mansbach, and Kasha Oelke. Three passed "with distinction"; the fourth slept through a submission deadline, but passed anyway. PSI (Patient Services Inc) is a national non-profit patient assistance organization that utilizes donations to subsidize the cost of health insurance premiums as well as copayments and coinsurance. Insurance Providers in several marketplaces are now prohibiting the acceptance of third party premium payments. PSI is working to introduce legislation that would require Federal and State Marketplace plans to accept third party assistance from nonprofit organizations, so that patients with expensive rare and chronic conditions will not have interruptions in their treatments and be left to again fend for themselves. 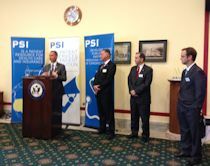 PSI is working in coalition with many groups to achieve this. More details are in this document. On Apr 22 our president, Peter Mansbach, attended a Congressional Reception at the Rayburn House Office Building (Washington, DC) in support of this effort. Two congressmen spoke: Rep David Jolly (R-FL) and Rep Leonard Lance (R-NJ). Both are in favor of helping people with rare diseases get increased access to the care they need. Rep Jolly is speaking in the photo. Please welcome Kasha Oelke as our new secretary, elected by the board to fill the vacant officer position. Kasha continues to be our Twitter and LinkedIn admin as well. Thank you for the work you do for us. March 2-8 is Sleep Awareness Week, promoted by the National Sleep Foundation (U.S.). "Sleep Awareness Week is an annual public education and awareness campaign to promote the importance of sleep. The week begins with the announcement of the National Sleep Foundation's Sleep in America poll results and ends with the clock change to Daylight Saving Time, where Americans lose one hour of sleep. " Circadian Sleep Disorders Network joins in supporting Rare Disease Day on Feb 28, 2015. 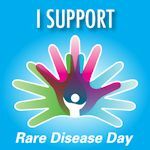 Rare Disease Day is promoted by EURORDIS (Rare Diseases Europe), NORD (National Organization for Rare Diseases, U.S.), and numerous similar organizations around the world to build awareness of rare diseases. While each rare disease affects relatively few people, there are some 7,000 rare diseases, affecting some 10% of the population in total (NORD). Non-24-Hour Sleep-Wake Disorder is a rare disease. It has estimated to affect about 90,000 Americans, mostly blind people. Advanced Sleep Phase Disorder (ASPS) is also believed to be rare. Delayed Sleep Phase Disorder is not rare enough to meet the NORD criterion of less than 200,000 people in the U.S. affected: tt has been estimated that half a million U.S. Americans are affected by DSPD. An article on DSPS appeared in the January 2015 in The Atlantic, titled "Not Everyone's Internal Clock Is Set for the 9-to-5". Thanks to Maggie for agreeing to be interviewed, and for her engaging description. Our president, Peter Mansbach, was also interviewed and appears in the article. Thanks to other members who were also interviewed but whose names are not mentioned. And many thanks to the journalist, Ilana E Strauss, for pursuing the information and talking to a wide range of people and writing up the results. Elections for the Board of Directors of Circadian Sleep Disorders Network have concluded (Dec 2014). Two current board members, James Fadden and Andrew Wall, were re-elected. Two new board members, Kasha Oelke and Jennifer Silvia, have also been elected. All are for two-year terms. Welcome to the new members! In September Circadian Sleep Disorders Network contacted the AASM (American Academy of Sleep Medicine) urging them to add Circadian Rhythm Sleep Disorders to their Sleep Education website. They replied that they were updating their website, and would consider our request. They have now added several pages on Circadian Rhythm Sleep-Wake Disorders. This is important for us in our mission to raise awareness of CRSDs. The AASM is the pre-eminent sleep organization in the U.S., and is charged with accreditation of sleep labs. They also publish important review articles for sleep doctors, for example Circadian Rhythm Sleep Disorders: Part II, Advanced Sleep Phase Disorder, Delayed Sleep Phase Disorder, Free-Running Disorder, and Irregular Sleep-Wake Rhythm (2007). So this addition certainly helps our credibility. Thank you, AASM. Previously posted: On January 31, 2014, the FDA approved Hetlioz (tasimelteon) for treatment of non-24 in the blind: www.hetlioz.com (Vanda Pharmaceuticals). It is now available in the U.S. by prescription. We assume it can be used off-label for sighted non-24 people, and possibly even for DSPS. It is supposed to work similarly to melatonin. For those interested, the (very long) transcript of the FDA meeting approving Hetlioz is available at http://www.fda.gov/downloads/AdvisoryCommittees/CommitteesMeetingMaterials/Drugs/PeripheralandCentralNervousSystemDrugsAdvisoryCommittee/UCM386061.pdf. Note: Circadian Sleep Disorders Network is not in any way affiliated with Vanda Pharmaceuticals, maker of Hetlioz.